Over/Under: Over 172.5 at 1.90 Bet Now! Having bounced back from their first Euroleague defeat in 8 months, the hosts will be looking to go on another lengthy winning run which will provide the platform for retaining their Euroleague title. 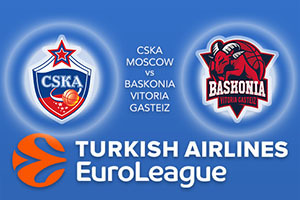 CSKA Moscow will fancy their chances against Baskonia Vitoria Gasteiz with the historical record between the two teams sitting at 20-6 in favour of the Russians. This game is going to be a huge challenge for Baskonia, and they’ll need everyone to be on top form. With a 7-1 record, CSKA Moscow started the week at the top of the Euroleague and they’ll be determined to stay there when the week ends. A recent defeat was brushed off quickly and the Russians will think this is a game where they can set off on a new winning run. There is one concern for the Russians though and that comes with the absence of Nando De Colo. Any team would miss the reigning MVP of the league and this is a blow for CSKA. However, with Milos Teodosic offering an average of 15.3 points per game and Cory Higgins chipping in with an average of 10.1 points per game, the Russians still have plenty of players who can decide this game. The absence of De Colo may be the best news for Baskonia but as they hold a 5-3 record themselves, it is not as they have endured a terrible season. This is likely to be a tough game but they have enough players who can impact on a basketball game and they will come with hope, although probably not with expectation. Andrea Bargnani has provided an average of 14.2 points per game for the Spanish side so far this season while Shane Larkin has chipped in with an average of 13.8 points per game. Johannes Voigtmann has also provided an average of 12.6 points per game so there are players who can grab points in the Baskonia side. The absence of De Colo is likely to blunt CSKA Moscow slightly. They should still win but consider taking Baskonia Vitoria Gasteiz at +10, which is provided at odds of 1.90. Anyone looking for the Over/Under market will find that going OVER 172.5 which is on offer at odds of 1.90 is likely to be a decent bet. Bet Now!